This is the story of Hackenschmidt’s life from the time he went to school, a small but chesty youngster, until he became “the Russian Lion,” known to all the people of the civilized world. He told it yesterday himself, sitting on a yellow leather trunk, in his room at the Astor. It tells how he keeps his strength, living as he does, the hardest of all lives – that of a stage athlete. “I was always too enthusiastic in everything that I took up. Even now, when I go into a wrestling match I become so furious that after it is all over I couldn’t tell you how I took the falls. Excelled in Strength at School. “I was a strong boy when I first went to school. In the primary and high school I stood first at the end of each term in gymnastics and last in everything else. I was second of four hundred pupils in singing. Oh! Yes, I was a very fine singer. But one day, when I started to sing, my voice became hoarse like a frog’s. The master was very angry. He made me try again, and my voice broke. That ended the singing, and after that I had more time for the gymnasium. “The gymnasium came after school. It was fifteen minutes away. The boys always ran a race on the way there. I could run fast, and I always arrived first. I never could get enough work. Sometimes I ran so hard that the blood would get in my throat, but I wouldn’t let anybody beat me. I must always win, whatever I do. “The first time I saw a wrestling match was when I was a small boy. There was a circus. It was thought to be bad for boys to see it, and a master from the school was always there to catch any of the boys that got in. I went and told my mother that I must see the athletes. I got the money to go, and then blacked my face up so that nobody would know me. I got away back in a gallery. When the wrestlers – they were very poor, but I didn’t know it then – came on, my heart went up in my throat. While they were wrestling I became so excited that I was sick. My heart beat so hard I thought I was going to die. After that I always wanted to be a wrestler. “When I was eighteen I got a bicycle. That was ten years ago, and it was a high one with a solid tire. When I had it two weeks I went in a two-hundred mile race on the road. After ten or fifteen miles my tire came off. I picked the wheel up in my hand and ran along the road after the others until I came to a shop. Then I got some leather straps and wrapped them around and around the rims until I had a big solid tire. I rode the two hundred miles out on that. It nearly killed me, and for three or four years afterward I had a sore thigh from the strain. But I finished the race. I won a lot of shorter races that year, and I have the trophies still. “When I was nineteen I was very strong. A doctor at St. Petersburg saw me, and asked me to come to his house and see what I could do lifting weights. I went. He had a lot of people there. First we had dinner. I had never drunk anything, and I drank a few glasses of claret. It went to my head. When the time came to lift I broke three world’s records. That was the first time I had tried it, and the doctor told me I would be a great weight lifter if I would come and live with him and practice. I thought that would be good. So in that way I became a ‘strong man.’ I worked harder and harder all the time. I was always working. After a while I became well known and I went into a big club. “One day Paul Pons, then the champion, came to the club to give some wrestling exhibitions. He offered a thousand francs to any one who could wrestle with him and not be thrown. I went up and asked him to wrestle me. “’But I am strong,’ I answered. ‘If you do not let me have the first bout with Pons, I will resign.’ So they allowed me to wrestle with him. I went at him and threw him all around. I won the fall in forty-six minutes. Then I was glad. I had beaten the champion. But I threw him so easily that even some of my friends thought it was what you call ‘fake.’ The wife of the director said to me: ‘It is easy to throw a wrestler who is paid.’ That broke my heart. I followed Pons to Moscow, where he was showing. But they wouldn’t let me go on with him. They begged me to go away. I could not meet him again until he had to wrestle me in the tournament in Berlin, and then I threw him in seventy-one minutes. Later I did it again in Vienna in forty-one minutes. That is how I became a wrestler. “Always I do a great deal of work with very heavy weights. I have a hollow iron ball with a hole in it. I lift that for a while, and then I put in some lead through the hole. When I can handle that easily I put in more lead, and so on. When I am training I am never satisfied unless I can lift a little more every day. That is the way to get strong. “Sandow’s way is all foolishness with little weights. That makes big, knotty muscles, but they are hard and dry and haven’t any strength for a real strain. A man doesn’t get strong unless he uses strength all the time. People say big weights make you muscle-bound. I have not found it so. Perhaps that was because I was always so strong, but I think it is best always to do the work that is hard. Of course a weaker man would use weights in proportion to his strength. “I never diet. I eat what I like. I eat a lot. They say the Japanese athletes eat little. Bah! the Japanese are a miserable little people. I don’t say that because I am a Russian. A man must eat to grow big an strong. Corn is good to eat, and vegetables. They say I eat a dozen eggs a day. That is a joke. I don’t. “If you want to be strong, get some dumbbells in your room, and work, work, work, whenever you have time. Eat any good food. Sleep as much as you can. If you feel lazy hold the weight behind your back and squat down nearly to the floor and rise up again. Do it more each day until you can do it a hundred times without getting tired. Then use a heavier weight. That’s my favorite exercise. It makes the legs so strong. When I do that I can jump further, and I am twice as quick. Heavy work makes a man quick, too. It was the Turners that started the saying that lifting weights makes a man slow, because they didn’t want weight-lifting to take the place of their gymnastics. 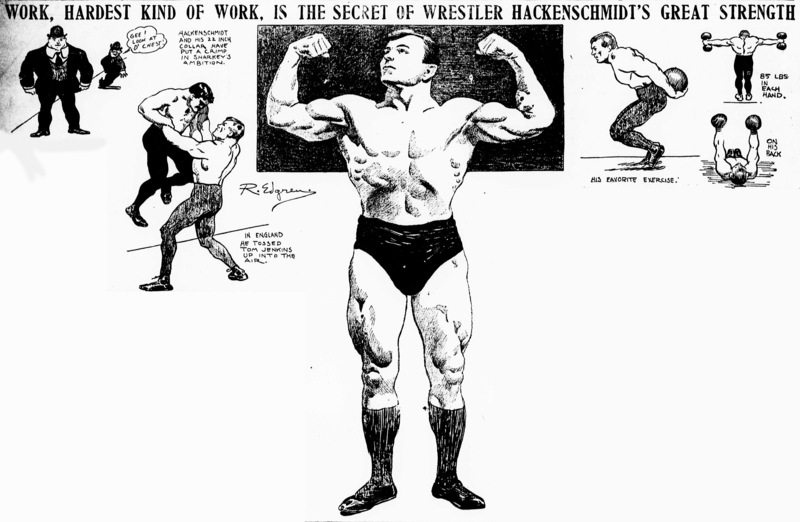 Hackenschmidt’s system of training has “made good” in his own case. He is 5 feet 10 inches tall, measures 52 inches around the chest (four more than Jim Jeffries), 22 inches around the neck, 33 around the waist (four less than Jeffries), 28 around the thigh, and 19 around the biceps. Taken all through, Hack’s measurements compare favorably with those of the ancient Greek statues of Hercules. He is a far stronger man than Sandow ever was. And in wrestling they say he handles a 300-pound Turk as easily as an ordinary Brooklyn man would a two-year-old baby. This entry was posted in 1905 and tagged George Hackenschmidt. Bookmark the permalink.